Matt Stanmyre, Steve Politi and Andrew Mills of the Newark Star-Ledger won first place in the Associated Press Sports Editors 2017 contest in the all-inclusive investigative category. The Star-Ledger trio’s investigative entry uncovered an international pipeline that stocked the rosters of a local high school’s boys and girls basketball teams over the past several years. Stanmyre, Politi and Mills will be presented a first-place plaque at the 2018 APSE banquet. The banquet and awards dinner concludes the APSE Summer Conference June 17-20 at the Marriott Hotel Nashville/Vanderbilt University. The second- through 10th-place winners will receive frameable certificates. Contest chair John Bednarowski and fellow APSE officers Jeff Rosen, Todd Adams and Robert Gagliardi numbered each entry. Preliminary judges selected a top 10, and from there another group of judges ranked the finalists in order from 1 to 10 separately on a secret ballot. Entries were given 10 points for a first-place vote, 9 for second, etc. The winner and final rankings are determined by tallying the ballots. 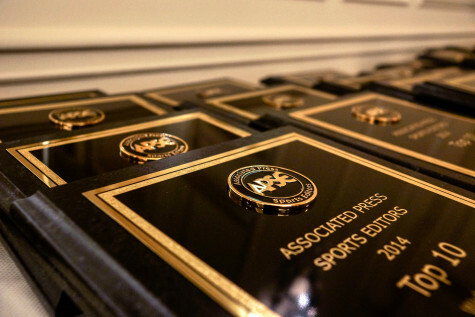 In judging APSE’s investigative category, main criteria considered included the entry’s enterprise, initiative, documentation, resourcefulness and original reporting in uncovering newsworthy and significant facts and developments that otherwise might not have been reported. Impact and aftermath of the work were also considered.